The deeds of James Smith and his Black Boys and Fort Loudoun would not be much known beyond the confines of the Cumberland Valley if it weren’t for Neil H. Swanson. Swanson was the editor of the Baltimore Sun whose passion for early American history led him to write a number of historical novels. In 1937, he penned The First Rebel: Being a lost chapter of our history and a true narrative of America's first uprising against English military authority. Swanson was a believer that the seeds of unrest against the British started at Fort Loudoun. His novel was made into a movie, Allegheny Uprising. And not just any movie - one starring legendary movie star John Wayne. Co-starring Claire Trevor, Allegheny Uprising followed the pair’s triumphant appearance in Stagecoach. The movie, released in 1939, however, was not a big success. Some of that may be blamed on the unfavorable portrayal of the British in the film. In 1939, Hitler was at his full power and the British were gallantly defending themselves and the rest of Europe from his grasp. In a few years, the British would be our allies in arms when the United States entered the war. The movie was released on DVD as part of John Wayne's 100th Birthday Anniversary observation. It is also shown several times a year on TCM. 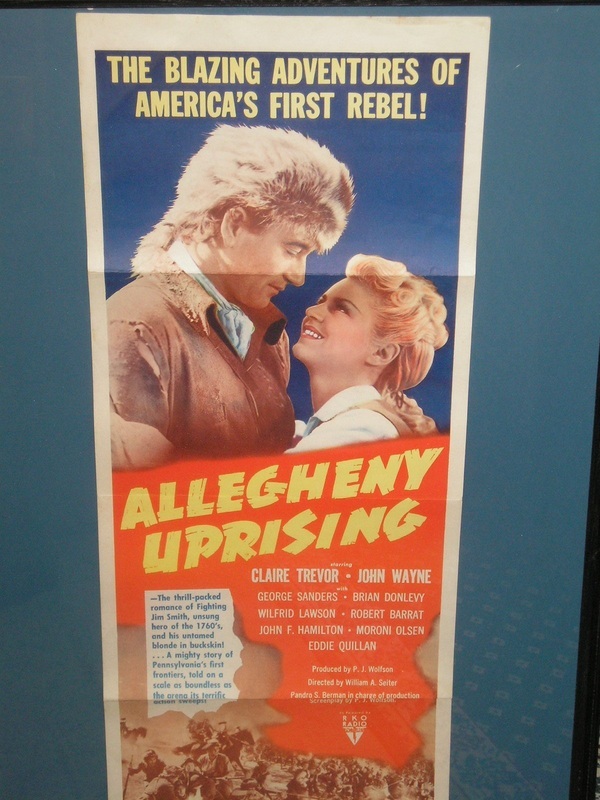 Allegheny Uprising was released as The First Rebel in several countries and enjoyed several re-releases in the 50s and 60s. The movie has spread the story beyond English speaking countries as well. 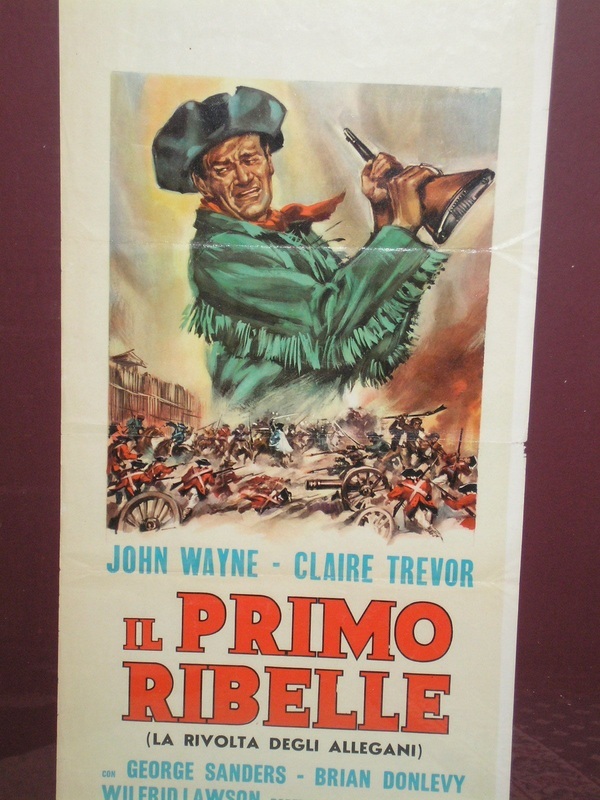 The author has Spanish lobby cards for the movie’s re-release in the late 50s and an Italian movie poster (date unknown). The book, The First Rebel, can be found occasionally on eBay or other online booksellers. Prices in the Fort Loudoun area run from $35 upwards. There is a first edition of the book - 1000 copies signed and printed from the original plates which contains black & white photos of local monuments and homes plus maps and drawings. Swanson was also a friend to the Fort Loudon Historical Society. Current president Anna Rotz was the secretary of the newly formed Society in 1975 when planning was underway to celebrate the nation’s Bicentennial in 1976. A keynote speaker was needed and several were suggested including John Wayne himself. Rotz received a reply from Wayne declining to attend due to his health but was honored to be asked. Swanson accepted the invitation. Rotz and Swanson struck up a friendship and Swanson visited the area many times before his death in 1983. At that time in the late 70s, the exact location of the fort was being discussed. While the official state marker had been placed at the farm at the end of North Brooklyn Road, there were still some who thought it was closer to Widow Barr’s. Swanson believed, based on his research, that the state marker was correct. Before his death, Swanson presented the Fort Loudon Historical Society with the original manuscript for The First Rebel.